Ferrando (Antony Zwerdling), comforts Dorabella (Kim Shahbazian) as he prepares to depart to join his regiment. The sisters ponder over their new suitors. 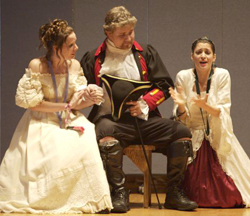 Fiordiligi (Jennifer Waters, left) and Dorabella (Kim Shahbazian, right) inform Don Alfonso (Robert Thomson) of their fiancees' imminent departure. 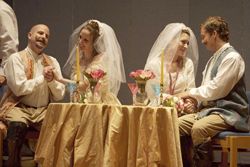 Fiordiligi (Jennifer Waters, left center) and Dorabella (Kim Shahbazian, right center) prepare to marry their new suitors from Albania. (Antony Zwerdling, left and Connor Newlon, right). 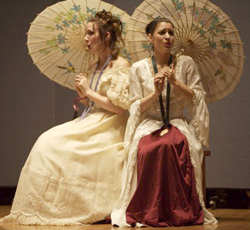 Despina (Alexandra Phillips, left) teaches Dorabella (Kim Shahbazian) how to properly deal with men. 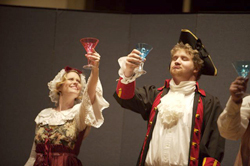 Despina and Don Alfonso toast to Love's fickle fortune.